It’s only taken 24 years – nearly a quarter of a century of nagging, eye rolling, chastising, throwing up arms in exasperation, cajoling, negotiating before I finally found a BG log book that would actually entice me to regularly record my readings. 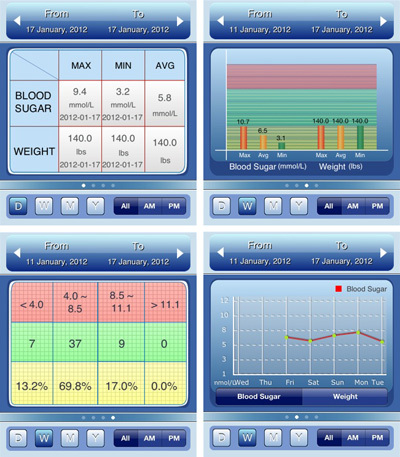 And I would have gone another 24 years easy (I’m not stubborn, not at all) had it not been for the recent discovery of Maxwell Software’s Glucose Companion iPhone app. I may be a good diabetic, but it didn’t matter what the doctors, the specialists, the nurses, the moms said or did, I was not going to write my blood sugars down. I have spent many years frantically recording my blood sugars on the night before my specialist’s appointment, or even worse, on the drive in. And every one always rolled their eyes, commenting that wouldn’t it be easier if I just wrote them down when I took them. Sure it would, but I never remembered, and that’s probably because I couldn’t see the benefit of doing so. That is, until my blood sugars took a major nosedive like they’d never done before a couple weeks ago. It didn’t matter what I ate, or how little insulin I took, they kept going low, really low, for more than a week, and it was really beginning to scare me. I needed to see what was going on. I needed to see the trends. I needed to see where adjustments could be made. But still, I couldn’t see myself picking up a pen and writing the numbers in a book multiple times a day. I started Google searching to see if there were any online logbooks I could tap into. But again, I wasn’t sure if I would use them. 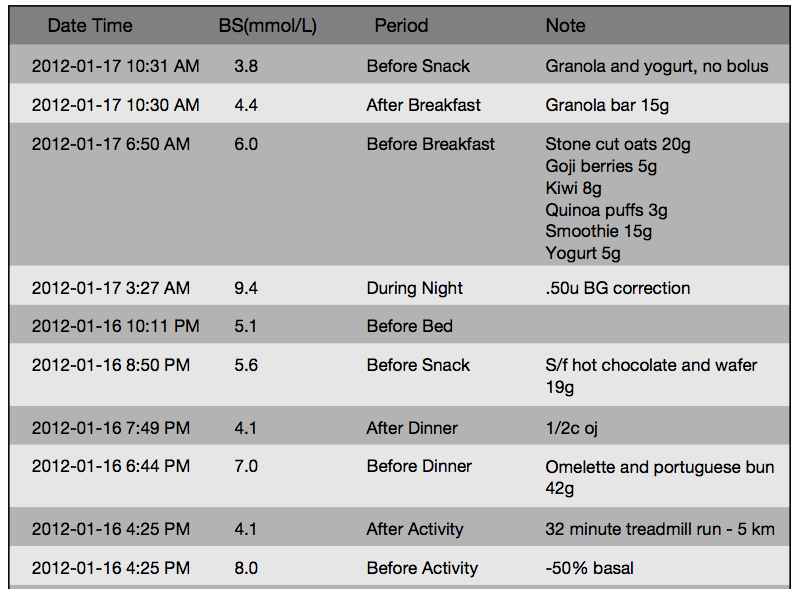 I test my blood sugars an insane amount through the day, upwards of 12 times a day when I’m not exercising, more when I am, and I just couldn’t see myself running back and forth to my computer to record the readings. But then, a lightbulb went off. 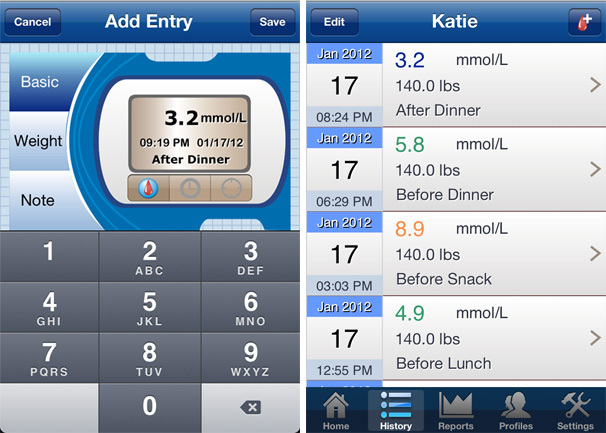 My iPhone is almost always within arm’s length away; when I’m running, it’s in my fuel belt, when I’m sleeping, it’s on my nightstand, and every other time it’s in my purse, right next to my glucometre. There had to be an app! There were. Quite a few in fact. But the majority were either ugly, or required special attachments, or were far too complicated, etc., etc. And so, when my eyes focused in on Glucose Companion, I kid you not, it was love at first sight. Just look at the ease of its design, and all that it provides. Recording numbers the old school way, won’t give me those charts, but will give me hand cramps. This way, I can export the numbers and statistics to my email in a CVS, HTML, or PDF format with the flick of a finger. No more frantically recording numbers before an appointment. No more hand cramps. Hallejuah!